Are you remodeling the kitchen and your kitchen counter is ready for new seating? The Amish Pierre Bar Stools are rich with solid wood. A scooped seat fits you comfortably for casual dinners, working at the counter, or enjoying your morning bagel. 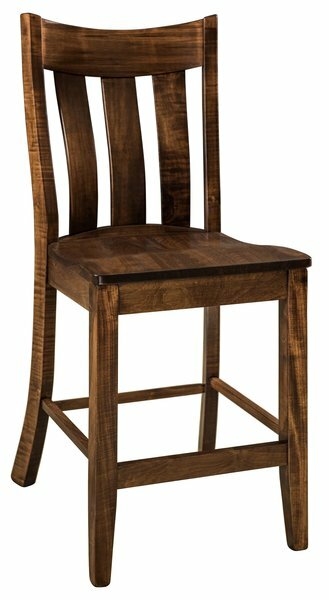 The Amish Pierre Bar Stool is shown here in red oak wood with earthtone stain. The Pierre style is also available as a swivel bar stool, dining chair and bench. We are happy to help guide you to the best custom bar stools for your kitchen. Furniture Specialists can be reached by email or phone. Please call us today. We thank you for taking the time to visit us here at DutchCrafters. Shown in Red Oak with FC 40592 Earthtone.